This year OpenRules will again be an exhibitor and a presenter at the major Business Rules and Decisions Forum 2016 at BBC conference on Oct 31- Nov 4, 2016, Las Vegas, NV. We are sponsoring this major BR&DM event for 13 years in a row. 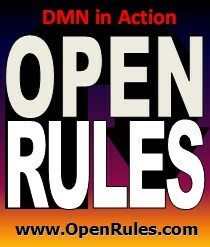 Our event theme will be “DMN in Action” as we will show our latest advances supporting the DMN standard. We will also present our newly developed “Why-Analyzer for Decision Modeling“. If you decide to attend BBC-2016 you still may receive a 20% discount when you register using our discount code “OPENRLV1620”. Stop by at our booth T5.